Most know that I am not a huge fan of Chinese, but I do love love love Orange Chicken! I wanted to try and re-create it at home but with a healthy twist. The deep fried version was not happening. I was able to make a crispy baked version that was just as good, if not better than the real thing! A major hit with the hubster and he is the Chinese food lover in the house! In a small bowl combine shake n bake, garlic powder, and ginger. Coat chicken tenders in shake n bake mixture. Place on a greased cookie sheet. Bake for 10 minutes on one side. Flip and bake for another 10 minutes, or until chicken is cooked through and coating is crispy. Top with orange sauce and serve over rice or noodles. Enjoy! To make the sauce: combine water, orange juice, orange zest, vinegar soy sauce, brown sugar, ginger, garlic, salt and pepper in a large saucepan. Whisk together. Cook over medium high heat. Bring to a simmer, whisking occasionally. In a small bowl, combine cornstarch and water. Whisk to combine and pour into the sauce. Continue simmering and stirring for 2-3 minutes while the sauce thickens. Remove from heat and set aside. Pour over chicken. I love orange chicken and I like that this is a healthier version of it! I am definitely bookmarking this to make in the future. Thanks for sharing with Simple Supper Tuesday! This looks so delicious! I've only eaten orange chicken when I'm out at a restaurant. I have yet to try and cook it myself. Goodness knows, I do a lot of cooking. Might have to see if I can actually fix orange chicken. Visiting from http://makeitorfixit.com. Stop by when you get a chance. Thank you! It's really easy to prepare. I'll be sure to stop by your page and check it out! 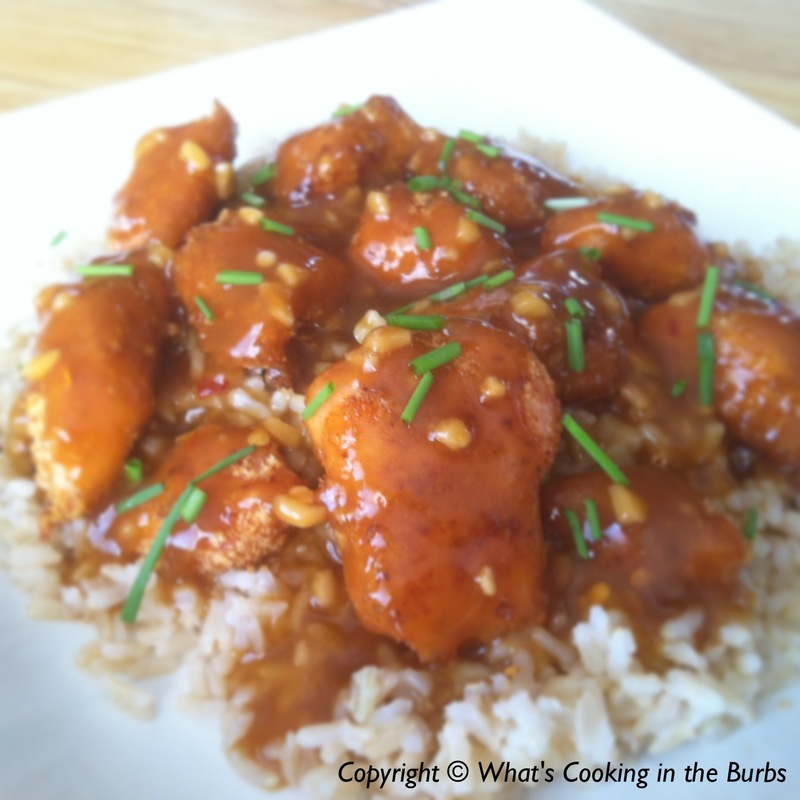 loooove orange chicken - about to pin this for later this week!! thanks for sharing the recipe! This is looks delicious. Yum. Have to stumble this one. I love that you found a healthier way to make this dish Bridget! We love Chinese food so I will definitely be giving this a try! Pinned! Thanks so much for sharing this at Wonderful Food Wednesday! Oh I love Chinese Food! I have book marked this to make soon! Thanks for Sharing at Show Me Your Plaid Monday's! I really like the healthy twist. Thanks for sharing at What'd You Do This Weekend. Looks easy enough. Orange chicken is the bomb, but I've never attempted to make it at home! It's actually pretty simple to make. I hope you enjoy it! Yum! This looks so good, Bridget! Thanks so much for linking up to All My Bloggy Friends!